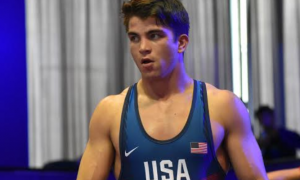 Peyton Omania Pre-JR Worlds: "I Can't Wait to Get Out There & Just Scrap"
If Peyton Omania (67 kg, CYC) gives you the impression that he was basically groomed from childhood to contend for a World title, that’s because it’s true. Unlike the majority of American wrestlers, Omania came up through a system that elevated international competition over domestic; a system where Greco-Roman was not only welcomed, but featured throughout the year. 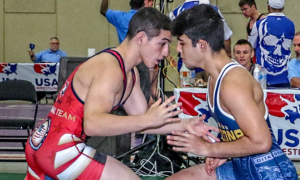 The curriculum at the Community Youth Center in Concord, California didn’t and does not shun folkstyle — how could it when the club leader is a high school head coach and Omania, a high school state champ, is currently beginning his freshman year at Michigan State? But this unusual upbringing can be credited for planting the seed in Omania’s heart that would grow into a desire to pursue both disciplines at the highest level attainable. 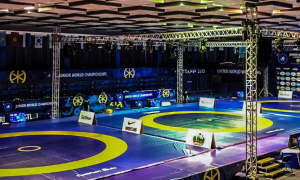 An all-important step on that journey will be taken next week at the 2018 Junior Greco-Roman World Championships in Trnava, Slovakia. Split into three days thanks to this year’s new weigh-in format, Omania will start his run to a World medal on the second — with hopes of remaining in the argument on the third. And there are plenty of indicators suggesting that could very well happen. Over the past few years, Omania has become one of the United States’ most talked-about prospects. 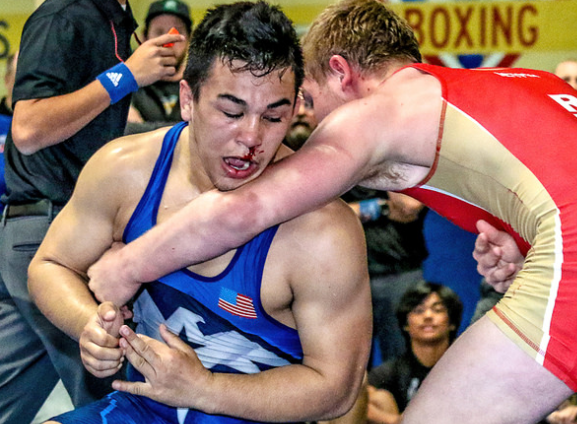 A Cadet World Team member in 2016 as well as a multiple-time winner of the Junior Greco World Duals, the Californian is recognized — and appreciated — for his scoring-friendly style, blitzing technique, and fondness for barnburners. A Peyton Omania match is something to get excited about. You know you’re going to see action, and you know that mixed in with the speedy technical flurries and occasional scrambles will be an element of violence that reminds you just how severe the price he’s agreeable to pay if it means getting his hand raised. D-Day is almost here for Omania and the rest of his World Teammates. The 2018 US Junior squad is deep and talented enough to where there has been a whole lot of talk about bringing home a Team trophy. Or Team championship. Either way, both are doable. The Team USA Juniors have a chance to make history and further the youth movement this country’s program is currently focused on. One reason why is the athlete who is suiting up at 67 kilos, a fact he is more than happy to embrace. Peyton Omania: Pretty much, honestly, all of 2017 was like a huge disappointment for me. I took sixth at the state meet in folkstyle, I didn’t make the World Team, and I didn’t win Fargo. After that I was just fired up. Those are the three things I wanted to do and I didn’t do any of them. So I was just fired up and I was like, There’s no way I am going to let anyone who helps me feel like that and there’s no way I am going to let myself feel like that anymore. I just worked harder and it helped out. But as far as motivation? I never looked at like that because I’ve been training my whole life for this, so I knew it was coming. 5PM: Your home club, CYC, is unique insofar that it is one of the very few in this country where Greco is a prominent style. Did you realize early on how different this kind of environment was compared to others? PO: I think so, because when I was younger — it’s a youth center, so there are tons of sports, activities, tutoring — and during the summertime my parents would drop me off there for game camp because they had to work. We would play dodgeball and whatever. I was like eight or nine-years-old and I’d be standing there like, I don’t know… And then Stevie (Gee) and (Mark) Halvorson would get me to throw dummies with the high school kids in the middle of the summer. So I think I got an idea pretty quickly going there when I was younger. 5PM: The lineage is well-known, especially with the current generation. The tree of mentorship has gone from guys like Stevie Gee, Kenny Cook, and Halvorson to Robby Smith, and from Robby and those guys to Lucas Sheridan, and from Lucas to you. What has that leadership meant as you have become a National-level competitor the past few years? PO: Oh, it’s really humbling. When I was younger, I remember they used to bring clothes in. They’d bring in their old, beat-up clothes and I would fight other kids for those clothes. That’s how much I looked up them and wanted to be like them. Now, I bring in my old crusty clothes and watch the kids go crazy for them. The family and tradition at CYC I feel is the most important thing. It means so much more than just wrestling, it’s a family there. It has helped me out a lot. When I was a kid I would just sit around and watch them wrestle and that was who I wanted to be like. I’ve worked hard enough to where now I find myself close to their shoes. 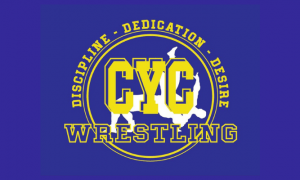 5PM: Another thing that CYC has offered you is the opportunity each summer to compete against international opponents in what is the toughest age-group tournament in the country. 5PM: Even though you don’t have the overseas profile some others do who have been to Sweden and wherever else, you do have international experience and that is a separating point between you and like 95% of the wrestlers in this country. 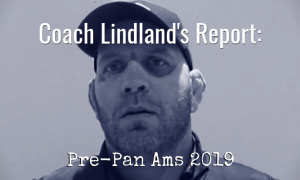 How does that play into your understanding and confidence going into the World Championships? 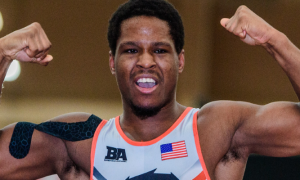 Peyton Omania: I don’t think just wrestling guys overseas is a big thing, it’s a lot of watching, too. I watch a lot of international wrestling. I watch all of the tournaments, all of the grand prixs, all of the World Championships. I try to replicate kind of how they wrestle with hard pummeling and being great from par terre. That has picked up my training and influenced me to wrestle a little more like that. Halvorson always tells me not get sucked into the folkstyle game in Greco. Because, it won’t work and you’re not going to beat them wrestling folkstyle. But it gives me a lot of confidence to know I can do it and helps me feel more prepared mentally. 5PM: What about Sheridan? He competed in the Junior Worlds some years back. What has he had to say about what you should expect? PO: Luke always has a lot to say. He tells me I’m an idiot a lot and not to be an idiot (laughs). He also tells me to relax, have fun, and that he’s proud of me no matter what. 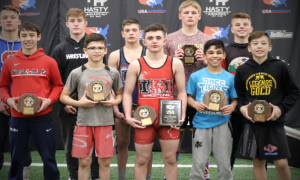 When I’m wrestling, having fun and opening up, like back home at the Greco World Duals, I don’t lose very much. I score so many points. So he just tells me to open up, have fun, and things will take of themselves. He tells me to break people, that no one has the fight like we have the fight in us. They’ll break, so he tells me to try and break everyone. 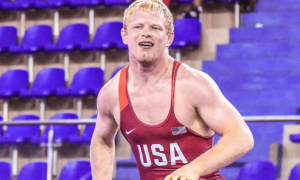 5PM: To make the Junior World Team, you had to beat a guy who has made several age-group World Teams himself in Dom Demas, who is a very talented wrestler. Those matches in Indianapolis were competitive and entertaining. With your experience now, do you feel it is important to be challenged like that to make a Team? PO: Yeah, that’s the whole fun and everything to me. I mean, obviously it’s fun beating people up, but I’ve had a lot of hard matches and the first thing I’ve said coming off the mat win or lose is, That was fun. Those are the matches where I’m letting it fly, scoring points, even giving up a couple of points, but putting on a show and doing what I love. It’s important to have fun and I think our matches were fun. Also, facing adversity before the real show is really important. 5PM: It wasn’t until early-August when the Junior Team got together for the first time at the five-day camp in Vegas. And it wasn’t just the Juniors, it was the Seniors, U23, and even some Cadets. For you personally, was Vegas camp a good jump-off point for your style heading into the main training phase for Slovakia? PO: I think so. I thought it was really good. (Jesse) Thielke and Ellis (Coleman) are two of my favorite people to wrestle because they are both really, really, really tough to score on and have a good amount of offense, especially Thielke. We were in a group of three a lot just banging and I was getting beat up, but it was a lot of fun. And then after practice everyday almost I was picking up techniques from both of them, no matter what it was — top, bottom, or standing. That was really good for me, at least. I think I wrestled more with the Seniors than I did with the Juniors, but it was really good training for me, for sure. Then we got to go to the OTC (Olympic Training Center) after and really about fine-tune everything. 5PM: Speaking of the OTC, you guys didn’t get a break, it went right from one camp to the next. For the Seniors, the concept of team unity has been important. The Juniors don’t spend the same amount of together, but do you feel that’s important, a kind of “us against the world” mentality? PO: For sure. I don’t even think of it as us against the world, I just think it’s good to feel comfortable with your teammates because it takes a lot of the pressure off of you. Obviously, our goal, we’re not always thinking about ourselves because we want to bring back a Team trophy. We placed high last year and we really want to bring a trophy back this time. A lot of people are always complaining how Greco doesn’t get a lot of love and all this stuff, but I think the people who really care and want that support are going to do something about it, rather than just tweet about it and talk about it. We want a Team title more than anything but when you don’t know anyone you’re wrestling with it kind of puts pressure on yourself like, Man, I don’t want to lose because I don’t want these guys to think bad about me. But when you know these guys are going to be there for you and support you no matter what, it makes life a whole lot easier when you’re wrestling. 5PM: In the present, you’ve had to deal with a lot of stuff. You moved onto campus as a freshman. It’s college, there is schoolwork, and on top of everything you’re preparing to compete in the World Championships. Has it been overwhelming? PO: It did get a little stressful for a second. My first couple of days here I got a little distracted, though I still got my workouts in. But I’ve settled in pretty good. Halvorson has been sending me workouts and the Michigan State coaches have been running me through them, helping me out a lot, getting me partners to work out with, working out with me whenever I need to. So yeah, it has been a transition but it has been good. 5PM: You’re leaving for Slovakia in a few days. You’ll get over there, have a couple of days to sort of acclimate, and then the tournament begins. Are you where you think you need to be with the tournament right around the corner? Peyton Omania: Yeah, I mean if there is any doubt in your head that you can’t be a World Champion why even go? I’ve put as much as I could into this. I feel like I’ve been doing all the right things. I’ve been working hard and staying away from trouble. I’m ready to get after it, I’m excited. I talked to my dad today and told him that I can’t wait to get out there and just scrap. I just have to get my weight down and we’ll be good to go. Follow Peyton Omania on Twitter and Instagram to keep up with his career and competitive schedule.